Do you remember what you did during seventh-grade art class? Vince Falcigno was working hard on a painting of a full-rigged ship, putting down on canvas what he was reading about in his spare time. "My reading at that time was all about the British and American sailing navies," says Falcigno, 58, a business insurance broker from Wallingford, Conn. "And I got into model-making, too." 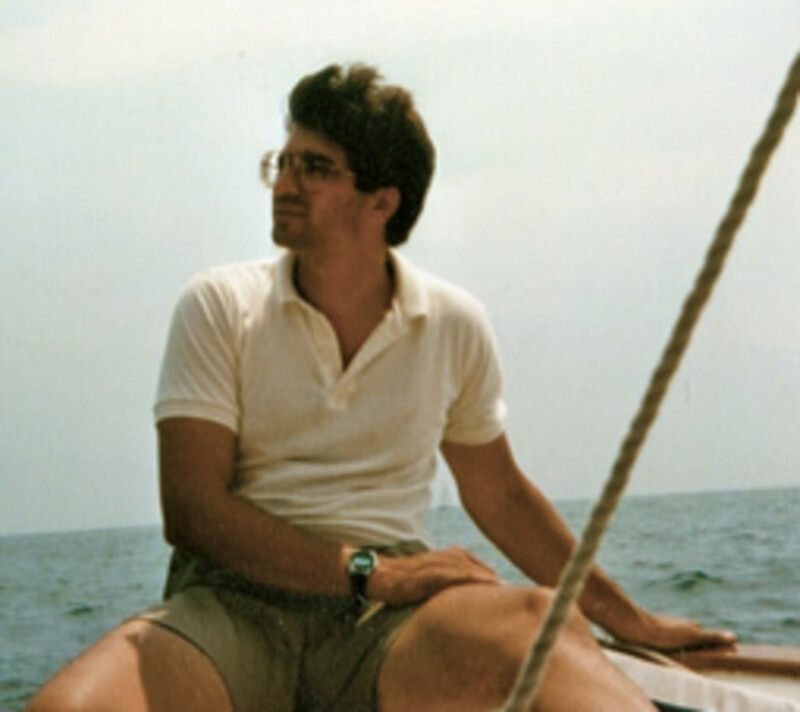 He also started sailing, on Blue Jays and Sunfish, and helped to build a New Haven Sharpie while working at the Dutch Wharf Boat Yard and Marina in nearby Branford. 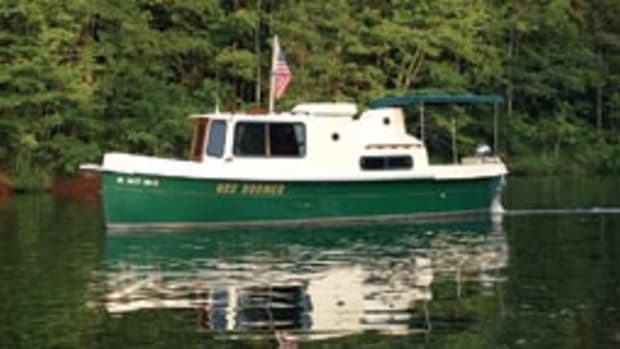 Today he owns a little fleet of practical, classic small boats headlined by a pretty sloop that spends its summers in Essex Harbor just north of the mouth of the Connecticut River. 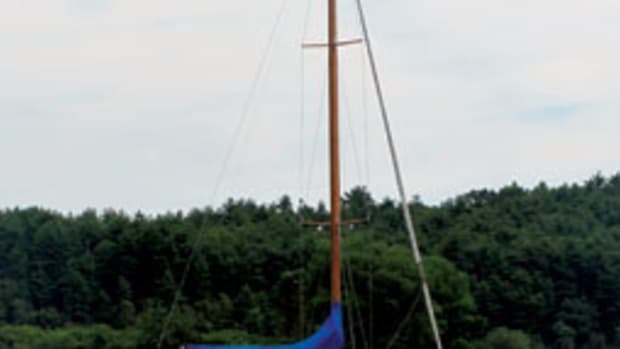 Reverie is a 1975 Edey & Duff Stone Horse, a 23-foot flush-deck fiberglass sloop designed by Sam Crocker, with overnight accommodations and a distinctive look that stands out even among the other vintage boats in the harbor. It was the flush-deck profile and the near-perfect proportions that caught Falcigno&apos;s eye. "I first saw a picture of a Stone Horse in a boating catalog in 1973," he says. "It was the only classic-looking design in a sea of white fiberglass and the concept of a fiberglass reproduction of a wooden boat was extremely appealing." But there was more to it than looks. 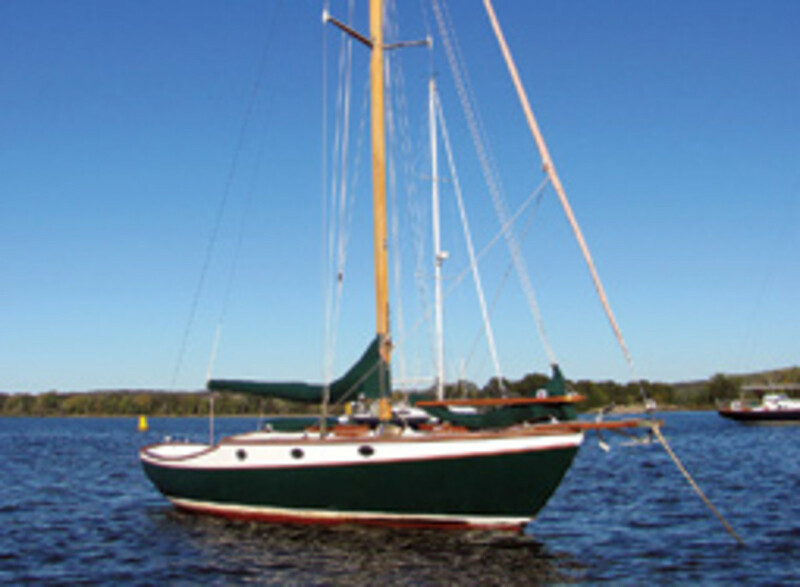 Falcigno cites the builder&apos;s story of a gentleman who asked Crocker for a "stout boat that would handle the seas on Buzzards Bay and south of Cape Cod, have a good turn of speed, a large cockpit for sailing with friends and a comfortable cabin for occasional overnighting." "That person could have been me," Falcigno says. "And the practicality of Airex core fiberglass construction, combined with the lines and beauty of [a wooden boat], was exactly what I wanted. I also am a firm believer in getting the smallest boat that suits your boating needs." He and his wife, Joan, knew it was the right boat. "In her size range, it was so much more boat than the others in her class, and it looked and felt like a wooden boat," says Falcigno. He paid $15,000 for the Stone Horse in 1986, and now it is a member of the family. "We regularly sail her over to Shelter Island [N.Y.], where we alternate between an evening or two on board and then at the Ram&apos;s Head Inn," Falcigno says. "I have sailed her from Buzzards Bay and to Martha&apos;s Vineyard, and now that we are in Essex, I envision our range extending out to Newport and Block Island [R.I.]." The Stone Horse sails upwind and reaches well, and she handles easily in a sea. Downwind performance was improved with an asymmetrical spinnaker, Falcigno says. The owner also enjoys keeping Reverie looking her best, and that&apos;s easier with a smaller boat. "As a perfectionist with a boatbuilding background, I had many plans for Reverie," Falcigno says. "My terrific friends at Dutch Wharf Boat Yard have worked with me over the last 25 years to improve and customize Reverie into a very special Stone Horse." 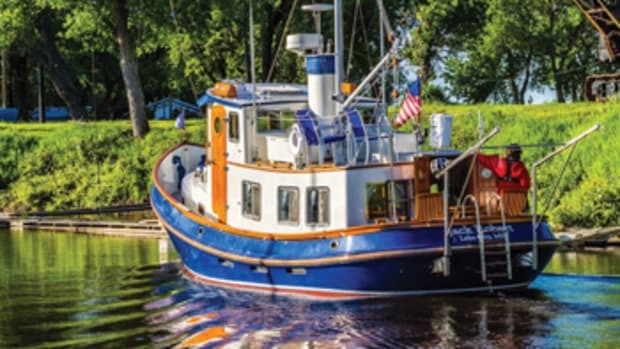 The work has included a repower to her current two-cylinder Westerbeke diesel, repainting decks and hull, a brightwork makeover, replacement of all running rigging and the addition of bronze hardware, and a cabin redo that included custom shelving and equipment storage. Falcigno&apos;s other boats are a Dyer Dhow he uses as a tender and a 14-foot John Atkin cedar-on-oak sailing skiff, which makes a great winter gunkholing boat. "That sits on a trailer, and its season begins when Reverie gets hauled," he says. "We frostbite on the river and explore the coves and creeks whenever we can between November and May." But there&apos;s nothing like summer. That&apos;s Reverie time. 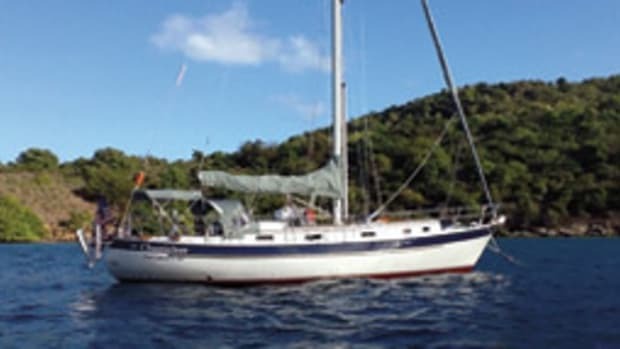 "She is a small boat and easy to handle, yet stout enough to get through Plum Gut and for later fall sailing," he says. "Reverie has met and exceeded my expectations for the type of sailing we do and we plan on keeping her until the day the nature of our boating changes." The 23-foot Stone Horse sloop has enough room below for a spontaneous overnight or a weekend away, thanks to a deep, beamy hull with a full keel and keel-hung rudder. Above the waterline, she shows a distinctive profile with a spoon bow and a gentle faux sheer line. The flush deck makes for a low cabin house, giving the boat pleasing proportions. Crocker gave the Stone Horse an ample cockpit, made larger by running the backstay to a boomkin. The builder calls the Stone Horse a "cutter-rigged sloop." 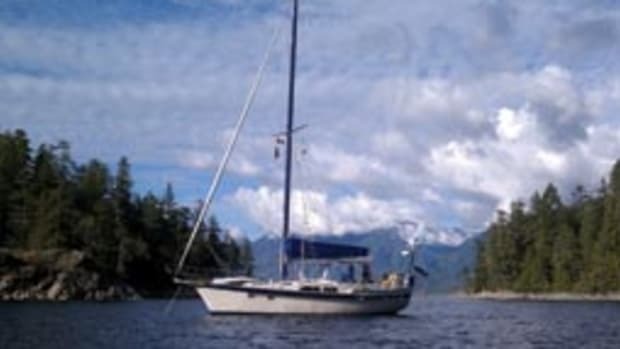 The masthead rig includes twin headsails, using a small bowsprit, and sail area is 339 square feet. 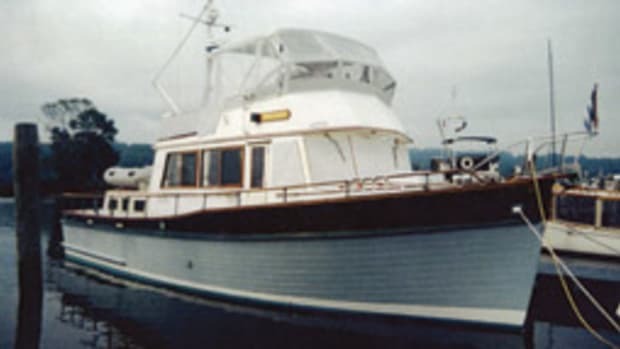 The centerline companionway with sliding hatch leads to a snug cabin below, laid out with a traditional V-berth with an insert, which covers the portable head. The small galley area has a sink, icebox and counter to port and a stove to starboard. Quarter berths on the port and starboard sides are sized for children and handy for storage. 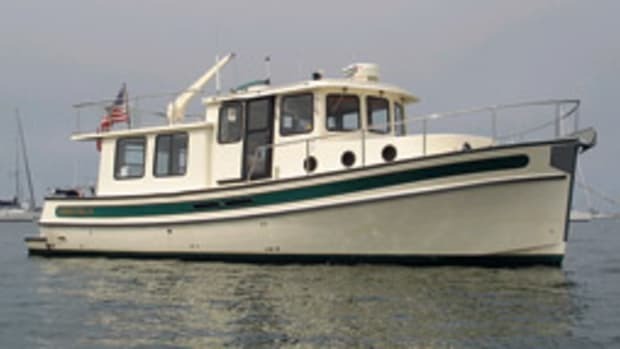 Power comes from an auxiliary diesel under the cockpit or a transom-mounted outboard. Stone Horse models are readily available and have spread to most parts of the country through the years. Prices for the boats vary. One "fixer-upper" was listed for $5,000, while boats in better condition were fetching $15,000 to $18,000. Outstanding boats are about $20,000. In 1968, Edey & Duff co-founders Mait Edey and Peter Duff started building "affordable boats of quality" at Duff&apos;s Mattapoisett, Mass., home. Their first effort, the Sam Crocker-designed Stone Horse, was finished in his wife&apos;s backyard herb garden. During the next 30 years, Edey & Duff Ltd. built almost 1,200 small craft, including 150 Stone Horses, as well as the Herreshoff-designed Doughdish and the Stuart Knockabout sailboats. 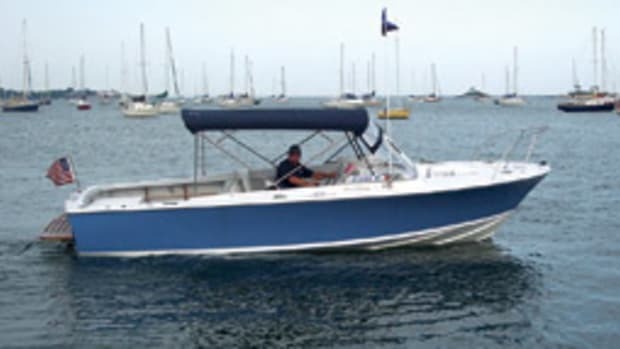 On the power side, the Conch 27 became a prized tournament fishing boat. Peter Duff passed away in 2008, company president David Davignon died in 2009 and Edey & Duff ceased production last summer. BUILDER: Edey & Duff, Mattapoissett, Mass.